The Sixth Judicial District Commission on Judicial Performance unanimously (10-0) recommends that Judge Anthony Douglas Edwards BE RETAINED. Judge Edwards was appointed to the County Court for the Sixth Judicial District (San Juan County) in July, 2014. He earned a Bachelor of Science Degree from Capella University in 2002, a Master of Water Resources Degree from the University of New Mexico in 2007, and a Juris Doctorate from the University of New Mexico in 2009. He served in the U.S. Army from 1990-1994. He has worked as an Environmental Scientist and Economic Development Coordinator and served as the Owner’s Representative for the San Juan County School District’s rehabilitation and renovation of the Silverton School. He has been in private practice since May 2010, and presently maintains his part-time civil law practice in Silverton. He also serves as the Town of Silverton Municipal Judge. The Commission conducted a personal interview with Judge Edwards, reviewed decisions he authored, his self-evaluation, and discussed his performance with representatives of the Public Defender’s and District Attorney’s Offices. Some members of the Commission had the opportunity to observe him in court. The Commission also reviewed a small number of comments from the public and the survey responses from attorneys and non-attorneys who appeared in his court. Due to his relatively short tenure at this part-time rural judgeship, there were only three completed surveys from attorneys and two from non-attorneys. In response to the survey question “how strongly do you recommend that Judge Edwards be retained in office, or not be retained in office”, two attorneys recommended that Judge Edwards be retained and one made no recommendation. Of the two non-attorneys’ completing the survey, both recommended Judge Edwards be retained. Judge Edwards received an overall combined average rating in the survey results from attorney’s that was above the average combined rating of all County Judges standing for retention this election. Judge Edwards received an overall combined average rating in the survey results from non-attorney’s that was below the average combined rating of all County Judges standing for retention this election. Judge Edwards presided over misdemeanor criminal, traffic and some civil cases in his courtroom located in Silverton. 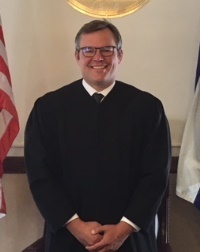 Judge Edwards was described as fair and thoughtful and having generated respect from the bench even while gaining experience as a recently appointed Judge. Judge Edwards demonstrates a commitment to improving his and other rural county court communications and knowledge by use of electronic means and his considerable computer skills. Along with other newly appointed County Court Judges, he is participating in the development of a new County Court Bench Book. The commission agrees with others’ observations that Judge Edwards is personable, eager to learn, and does not hesitate to seek advice from other judges. The commission is impressed by Judge Edwards’ use of all resources available to him and that he has proven to be a very good County Court Judge serving well the needs of San Juan County and Colorado.